Discover how, by activating the right touchpoints, Ariel changed the habits of its consumers and improved its brand equity. People are used to washing their clothes at 40° or 60°, because they think that 30° is not enough. In addition to the strength of habits, people do not always think about being eco-friendly since “saving the planet” since like a distant and unachievable goal for a single individual. How do we make the consumers of Ariel switch to 30°? How do we break the current habit and create a new one? How do we make people realize that 30° is as effective as 40° or 60°? A washing temperature too high wastes energy. 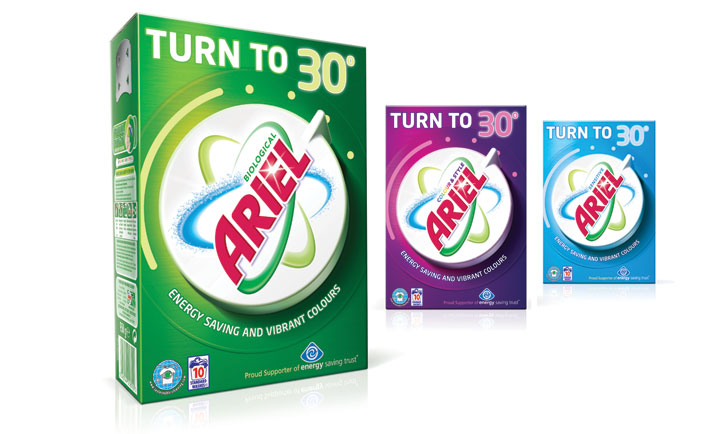 Since Ariel is used by consumers to do their laundry, the brand can assume the role of a messenger and benefits from a good exposure to the targeted individuals. Apart from very soiled clothes, 30° washes as well as 40° or 60°. PRINCIPLE : Making the message salient at the right time (when the consumer is about to do the laundry), and using a message that is very concrete and simple in order to make people do something for the environment, which will in turn make them proud (they do something for the environment). EXECUTION : Put the message “turn to 30°” on the package with a picture of a switch mimicking the one on the washing machine, which both shows that the consumer only has to move the switch a little and that it is possible to wash well at 30° with this product. FIELD EVIDENCE : According to an Ipsos MORI survey conducted In the UK, the proportion of consumers washing at 30° went from 2% in 2002 to 17% in 2007, and 85% of these consumers said they changed thanks to the campaign.